From Production I.G, comes a collection of five award-winning short films. Production I.G's animated short film based on Machiko Ky's Mitsuami no Kami-sama (Braided Pig-Tail Deity) manga, won the Platinum Remi Award in the Classic Cel Animation Category at the WorldFest Houston International Film Festival. 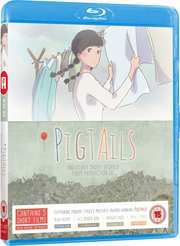 The story centres around a pigtailed girl who lives alone in a solitary house by the sea after an unspecified disaster.